Since I was in Maryland i.e. Home today we took the opportunity to grab lunch with kid No 1 and the missus. The venue Rio Grande at the Rio in Gaithersburg. As it was a day when the schools had closed the place was not full at 1.30 on a Friday. We have been here but not that frequently. The Rio complex has another Mexican restaurant called Guapos.. My wife and daughter had the Fajitas al Carbon with chicken and I had the Sonora platter with chicken. There is a difference in the food between Mexican restaurants and I like food that is a little spicy. In my meal I didnt like the Tamale and the enchilada as it was a little bland . I would like to give the restaurant the benefit of doubt as it may be me who should change my taste. I liked the red beans a lot. I liked the tortilla machine, i wish they could have whole wheat tortillas made in the machine. See the video of the machine below. Is it me or does it seem like restaurants have raised their prices? 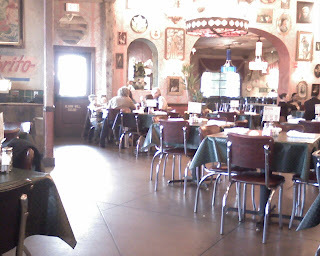 In summer the Rio Grande cafe is lively specially in the evenings. Lunch time I would skip and go to the El Mexicano.